The bathroom scale has come a long way from where it was in the past few years. Gone are the days when you had to struggle to figure out just where the pointer stopped on your machine. These days, bathroom scales aren’t just easier to read, they are also more accurate and offer a greater number of features as well. Unfortunately, this also means that it is a lot trickier to decide which bathroom scale is for you. So, we decided to take a look at all the options on the market and figure out which of them are actually worth your investment. There is no denying that this is definitely one of the easiest devices you can use. This is because it is equipped with an auto on and off feature. So, you are powering it on simply by stepping on it, and when you get off, it switches off to save the battery. There is even an auto-zero function where the scale goes to zero once you aren’t putting your weight on it anymore. The other reason this scale is so easy to read is that it has a backlit digital display that allows you to see the results in all lighting conditions. Now, for the most part, this bathroom scale is quite accurate as it is equipped with precision German technology sensors. This means that it measures weight changes up to 0.2lbs. However, it should be noted that this scale is only precise if you step on it the right way. You have to center your feet on the scale or you may find that you are provided with varying results. The scale also has a good weight range. You can monitor weights between 11 and 400lbs. This means that everything from your cat to you can be weighed with this scale. While this bathroom scale may appear to be rather delicate, it is actually made of tempered glass. This makes it quite sturdy and durable, ideal for long-term use. 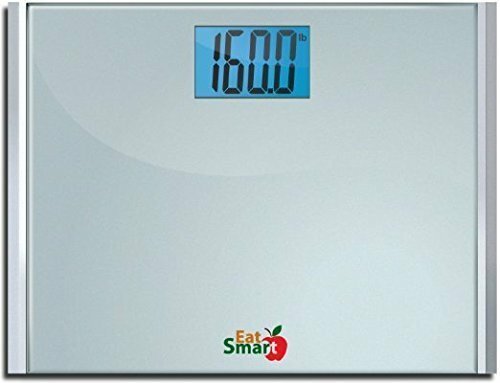 You will almost instantly notice that this digital scale is a little wider than most – the platform is over 15 inches wide. This means that regardless of your size (especially feet) you will have no trouble fitting on this scale. At the same time, it can be a bit of a downside for anyone with tiled floors. See, with smaller tiles, the scale will overlap, often balancing on the space between them. This can make it a bit wobbly. The other perk with this bathroom scale is that it is very simple to use. The auto power function means that it turns on and off by itself. Similarly, the auto-calibrate feature ensures that the scale can set itself back to zero, once you have stepped off. This improves the accuracy of future readings. Speaking of accuracy, there are four high precision sensors included in this scale to ensure that you get the most precise readings possible. On top of that, the scale is able to register up to 400lbs and can notice variations up to 0.2lbs. All of the easy-to-use features are compounded by the fact that the backlit digital display is quite large. So, with just one glance, you will be able to view your readings. The only other real issue with this scale is longevity. At the most, you can expect it to last about a year, before its accuracy begins to suffer. If you are looking for a cheaper option, this bathroom scale is certainly the one for you. The good news is that despite its low cost, this scale is still quite accurate. It is equipped with four hi-tech weighing sensors that ensure the readings you get are precise. So, you will be able to get readings up to 400lbs, with an accuracy of up to 0.2lbs. The only issue is that you need to make certain that the bathroom scale is placed on a solid, hard surface to get the most accurate results. For instance, if you place it on a carpet, the readings may be incorrect. The scale also has a number of different automatic features. For one thing, the auto power feature guarantees that the scale will turn on and off just by stepping on and off it, respectively. The scale has also been designed with an automated calibration function which means that it sets itself back to zero. These aren’t the only features that make this scale so easy to use, however. The large, backlit digital display makes it an absolute breeze to read your results. The other advantage of this scale is that it is very strong. It is made from scratch and shatter-resistant glass that is difficult to break. 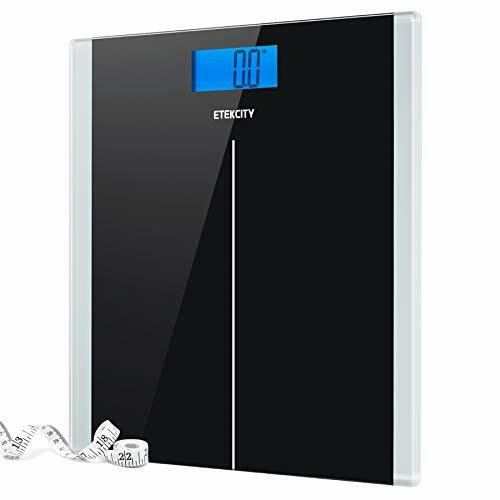 If you are unsure of using glass bathroom scales, this is the machine for you. Since it is made of durable plastic, it won’t get easily damaged. To top it off, the plastic platform has a non-slip patterned design that allows you to step onto the scale and be confident that you won’t slip off. This scale is able to measure anyone or anything that weighs between 11 and 400lbs, which is a good range for most weighing purposes. It also offers up graduation increments of up to 0.2lbs. The scale contains four high precision sensors that allow you to get accurate results. Be aware, though, that the level of accuracy depends on how you stand on the scale. So, you will have to center your feet and body for the most precise results. The other thing that you can appreciate with this scale is just how easy it is to use. This is largely to do with the automated features – automatic power on/off and calibration. Then, there is also the fact that the backlit digital display has a large screen that allows you to quickly read the results. 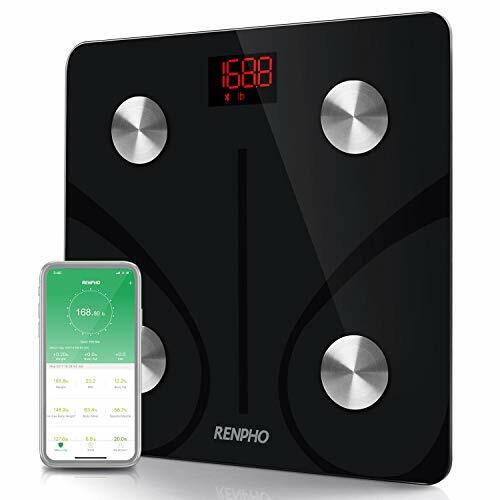 If you want a bathroom scale that can do a lot more than just provide you with your bodyweight, you will find that the RENPHO scale is a good choice. Now, of course, it firstly measures your weight. It is able to detect weights up to 396lbs in increments of up to 0.2lbs. In addition to this, though, it is also capable of monitoring 10 other key body composition statistics. This includes body fat percentage, bone mass, BMI, muscle mass, and water weight. This gives you a more complete idea of your health, especially if you are on the road to either slimming down or bulking up. Now, for the most part, this scale is rather accurate. This is largely due to the four precision sensors and the four electrodes embedded in the device. That being said, it isn’t equally precise for all of the weight categories. For instance, as with body fat percentage, this scale tends to be a little off. Another great feature is that this scale can sync with your phone, thanks to the Bluetooth feature. This makes it a lot easier to keep track of the various statistics. Last but not least, it is also durable as it is made from tempered glass. If you want to buy the best bathroom scale, you need to be aware of what to look for. Here we discuss the various types, features, and other elements to consider when shopping for one. Analog Scale: this is the more traditional type of scale that is still commonly used. It relies on a spring mechanism that is depressed when you step on it. In turn, the spring moves a disc which then causes the pointer to move and hover over your weight. While these scales do have the advantage of being accurate, they can become less effective with continuous use. It can also be a bit difficult to view readings precisely on this scale. Digital Scale: these are quickly gaining popularity in households. This is largely because digital scales are very simple to use and read. They are also very compact and can fit into most small places easily. The main problem with these scales is that you have to center yourself on them to get proper readings. The readings can also be off if the batteries are low. Comprehensive Digital Scale: this kind of scale does more than just detect your body weight. It is also able to calculate a variety of other statistics. So, these are usually a good option for anyone who is focused on fitness and wants a more detailed idea of their body composition. One of the first things that you should look out for is how much your scale is able to weigh. Most modern scales are capable of weighing 300 to 400lbs. So, if your weight falls within this range, then most scales should work for you. If you are a little heavier, though, you may want to consider getting a high capacity scale for more accurate results. 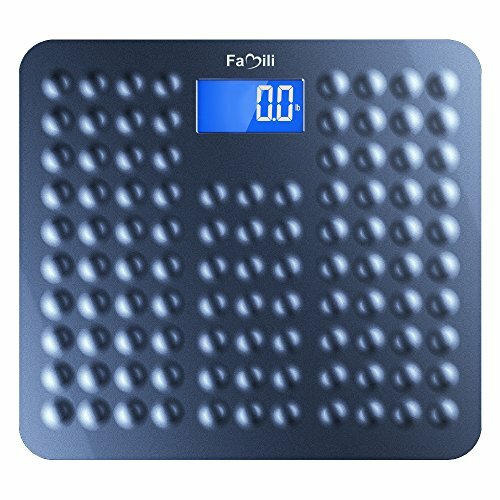 Now, depending on what you want to use the scale for, you may also want to consider the minimum weight capacity as well. For instance, a number of people also use their bathroom scales to weigh smaller animals such as cats. If this is something you want to do, then it can be useful to know the lowest weight limit. Now, there are a lot of factors that can affect the reading of your scale. That being said, it is important to invest in a scale that is both accurate and consistent. So, what does this means? Accuracy refers to how capable the scale is of detecting your real body weight. Accurate scales should also be able to precisely monitor weight loss or weight gain, as it happens. Consistency, on the other hand, refers to ensuring that you get the same result over and over again. This means that if you were to step on the scale several times, you would get the same result every time. In many ways, the consistency of your scale helps to back up the accuracy. If you want to make certain that you get the right results each time, you should look for a scale that is capable of calibrating itself. This way, every time you step off the scale, it will automatically set itself back to zero or the standard reading. It should be noted that most automatic calibration scales can also be calibrated by manual means as well. Regardless of whether you choose an analog or digital scale, you should still be able to see the readings carefully. So, look for a scale with a large readout area. This way, you will be able to look down and quickly see the readings, reducing the chance of making a mistake. If you do decide to go with a digital machine, then make sure that the display is backlit. This will allow you to see the readings in all lighting conditions. The other thing to keep in mind with these bathroom scales is durability. This is especially true for digital scales as they tend to be thinner and just a little bit more delicate. You will find that glass scales are most common but that doesn’t mean they are any less durable. However, it is best to look for those made of tempered glass if you want to make sure they will last. If you are really nervous about the thought of using glass scales, there are plastic options as well. While these don’t feel as vulnerable as the glass design, you should still check that the plastic is of high-quality. Platform Dimensions: it is a good idea to pay attention to the platform dimensions. This is especially true for anyone with larger feet. To be able to get accurate weight readings, your feet need to fit on the platform. Weight Unit Modes: depending on where you live, you will probably prefer reading your weight in either pounds or kilograms. This is why you should check that the scale you buy has your preferred mode. This way, you don’t have to worry about doing any conversions or calculations. Auto Power Feature: if you want to make using your bathroom scale even easier, look for models that offer automatic power features. This way, the scale will only turn on when you step on it and switch off once you leave the platform. 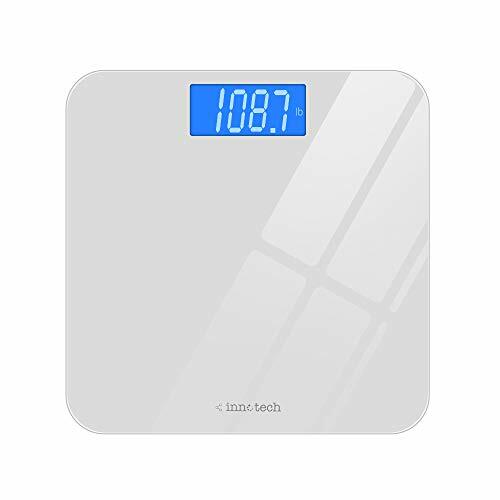 So, to summarize, look for a bathroom scale that detects your weight accurately, has a display that is easy to read, and is durable. If you are looking for a budget option, then you will find that the Innotech scale and the Etekcity scale offer you the best value. On the other hand, if you are more interested in the number of features, the RENPHO scale is the most advanced machine. If safety is your concern, then the Famili scale fits the bill perfectly. However, if you prefer a wider platform, the EatSmart scale will serve your purpose. You are now equipped with all the choices, details, and tips that you need to find a bathroom scale that is perfect for your needs.